Sharing the same model number and a similar name the MS-06D Desert Zaku serves as an improved version of the MS-06D Zaku Desert Type. 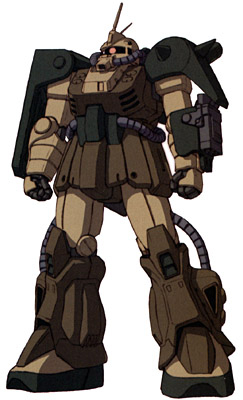 Featuring much of the same technology the Desert Zaku has been improved by redesigning the joints to include more sand filters and armor to block the sand of the desert. This equipment allows the Desert Zaku to be buried in the sand without the worry of sand clogging its equipment, thus allowing the unit to lie in wait for enemy forces and ambush them. The unit also features better power output, external propellant tanks on its backpack to carry extra thruster fuel, and additional shields for defense. To improve mobility the Desert Zaku has an optional pair of jet skis that can be mounted on the units feet that allow the Desert Zaku to propel itself over the sand in a manner similar to a skier on snow.